Upheavals to our scientific understanding of Earth's geophysical phenomena come along regularly. Campbell's bombshell is only the most recent one. Recall that we wrote about a new understanding of plate tectonics and its support for Cayce's readings on Atlantis, as afforded by Prof. MacKenzie Keith. Like Keith, Campbell is a recognized expert in his field and someone to listen to. He published a book entitled, “Earth Magnetism,” in 2001 (Academic Press). To explain his statement (in bold above), Campbell begins by reminding us of a few facts about our planet's magnetic field. “When a magnetic field can be represented by an axially symmetric dipole pattern similar to an electric field from a pair of equal and opposite electric charges, the axis of this magnetic field is called a pole….With the magnetic dipole center location corresponding to the Earth's geographic center, and the Earth completely spherical, the exit position of the magnetic dipole corresponded to the location of a fully vertical dip of the field. Global maritime exploration that started around the time of the epic 1492 Columbus voyage greatly depended on the ship compass for navigation and on magnetic declination maps for guidance. It was only natural that considerable interest in special expeditions to locate the mysterious arctic and antarctic Earth magnetic poles subsequently arose. Unfortunately, however, the Earth is not completely spherical and the center of Earth's geomagnetic dipole field is not co-located with the geographic center of the Earth. (See Figure 1 for a schematic of Earth's field as offset from Earth's center). These facts bear heavily on the scientific value of the many polar vertical magnetic field locations surveyed over so many years. Fig. 1. Showing diagrammatically an Earth magnetic dipole field offset from the center of our planet. 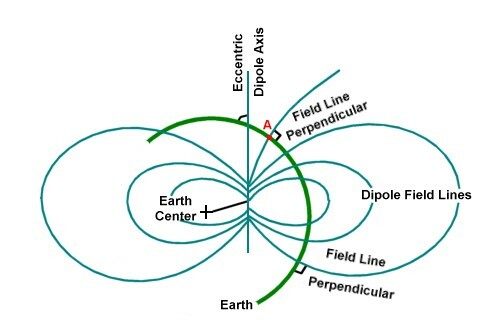 Point A shows an internal magnetic field line that is vertical to Earth's surface, but which is not at all representative of the dipole axis location. (This figure is modified from Campbell's Fig. 1, and is exaggerated here for illustrative purposes). Now Campbell explains that there are two significant geophysical phenomena that result from the eccentric location of Earth's dipole field. The first has to do with what is known as the South-Atlantic/South-American anomaly of low field strength. It seems that Earth's dipole field is offset here in the direction opposite from this anomaly. Because the actual dipole of the Earth's geomagnetic field "pierces" the planet at an angle that is both offset from and at an angle to the rotational axis of the Earth on the Australian side of the planet, the field lines going through the Earth must travel a further distance to emerge on the South American side. That makes the lines of force on that side of the planet significantly weaker, thus accounting for the anomaly. One can see this anomaly of the total geomagnetic field in Figure 2. Fig. 2. Total magnetic intensity of Earth's main field. Fig. 3. Coronal aurora (orange) for Earth's geomagnetic field. The other significant geophysical factor is that the high-latitude particles that bombard the polar region during geomagnetic storms are guided by the eccentric dipole field pattern. This results in an oval aural center that locates the true magnetic pole position. This oval center is only slightly modified by seasonal or “disturbance-level” magnetospheric conditions. Campbell concludes that the vertical dip locations reported in the previous articles,1,2and which we ourselves used to infer that the apparent rapid motion of the NMP was related to a magnetic jerk, are not important for the knowledgeable scientific activities of today's world. Needless to say, Campbell's tersely cogent paper has left a lot of geophysicists full of embarrassment to think that they could have concerned themselves with “magnetic pole positions” of such dubious usefulness for so many years. We consider ourselves to be part of a rather large, and somewhat embarrassed group of commentators on Earth's geomagnetic field. On a related note, we hope that this article by Campbell will put a damper on those many people who have spoken or written so excitedly about “the rapidly shifting magnetic poles,” and “Cayce's” pole shift prediction. That prediction, in reading 3976-15, does not deal with a shift of the magnetic poles. any more than the present locations of vertical magnetic dip lines accurately describe the locations of the north and south poles of Earth's magnetic field dipole. Reading 3976-15 deals with a shift in Earth's rotational poles. And when it comes to concerns about today's rapidly shifting, northern vertical dip location of the geomagnetic field, consider our analysis about the last significant magnetic field excursion in the northern hemisphere. Is Earth's Magnetic Field About To Flip Because Of "Core Problems"? Most probably, Earth's magnetic field is not about to flip. What some people call the Earth's north magnetic pole (NMP) is right now on an "excursion." It is not on a flip trip because the movement of the core has begun to slow down or otherwise behave strangely. (See the BBC's review below of the movie, "The Core"). Have we any evidence of past excursions of Earth's magnetic north pole? Yes, we do. The evidence comes from ancient geomagnetic pole locations of the dipole field, as determined from remnant magnetism measured in (oriented) specimens of rocks, sediments, and archaeological objects. The geomagnetic field directions at the specimens' sampling locations are parallel to their measured remnant magnetization directions. Determinations of locations of the ancient north poles discussed below will be off by probably no more than a few hundred miles or so from the true, ancient pole locations. There is a significant article in the March 4, 2003 issue of EOS (Transactions of the American Geophysical Union), a weekly newsletter for geophysicists. It is entitled "Ezekiel's Vision: Visual Evidence of Sterno-Etrussia Geomagnetic Excursion?" The article builds upon an earlier EOS article of April 16, 2002, entitled, ""Ezekiel and the Northern Lights: Biblical Aurora Seems Plausible." Authors of the earlier article present arguments showing that coronal auroras can occur at low latitudes under a condition of increased geomagnetic-dipole field strength. From this standpoint they give an interpretation of Ezekiel's vision (the Bible's Book of Ezekiel in the Old Testament). The location of Ezekiel's vision was about 100 km south of Babylon, or about 32ºN and 45ºE. Auroral specialists believe that Ezekiel's vision was inspired by a very strong magnetic storm accompanied by coronal auroras at low latitudes. Scientists have been investigating this possibility since 1973. The evidence for it is brought together in the March 4, 2003 EOS article. It's central thesis is that the Sterno-Etrussia geomagnetic excursion , which occurred 2200-2800 years ago, is the cause of the coronal auroras seen by Ezekiel at low latitudes. To date, evidence of the Sterno-Etrussia excursion has been found in the directions of magnetized mineral grains in oriented archaeologic specimens, as well as in specimens of marine, lake, and continental sediments from 15 widely distributed localities. The magnetic north pole during the excursion of 2800 to 2200 years before the present (B.P.) moved from high to low latitudes in the longitude sector of the meridian at which Babylon is located. Coronal auroral displays (cf. Fig. 3) could be observed at Babylon's latitudes during the period of Ezekiel's vision, regardless of the levels of solar and geomagnetic activities. And during moderate disturbances, the inhabitants of Babylon and regions to the south could witness colorful displays of coronal auroras that are typically observed only by inhabitants of the polar regions. From the standpoint of rapid magnetic pole movement, which is where we started in this section, it is clear that the north magnetic pole (NMP) position of 2800 to 2200 B.P. was a very long way off from the location of today's NMP. The excursion path (Fig. 2 of the 3/4/03 EOS article) reveals not only a very rapid movement of the NMP during this 600-year-long interval, but also an NMP excursion of considerable distance. There are, in fact, some six independently determined NMP excursion locations in the southern hemisphere, three of which are in the vicinity of 60ºS and 0ºE. We know, of course, that the geographic poles neither flipped, nor shifted, during that period of time (2800-2600 B.P). It is not just the plot for a far-fetched science-fiction disaster movie. Something unexplained really is happening to the Earth's magnetic field. In recent years, the field has been behaving in ways not previously seen in the admittedly short time it has been monitored. Some researchers think it may presage a geomagnetic reversal when the north and south magnetic poles flip. Such speculation takes place as the science-fiction movie The Core goes on release. In the film, the Earth's core stops rotating and our planet's magnetic sheath collapses. A manned mission is dispatched to the centre of the Earth to "jump start" the planet. Scientists admit there are things going on way beneath our feet that they do not understand, and which could have profound consequences for life on the surface. The Earth's magnetic field is caused by motions in the ball of molten iron that lies at the centre of our planet. Electrical currents in the outer part of the core result in the planet-wide magnetic field. The magnetic field not only shields us from harmful cosmic rays but also funnels charged particles shed by the Sun towards the magnetic poles, where they can produce beautiful auroral displays. The field is also an invaluable aid to navigation. Even though today we have the pinpoint accuracy of the satellite-based Global Positioning System, many still rely on their compass needle pointing to magnetic north. But as all who use a compass know, the position of the magnetic pole changes and there is evidence that it is changing at an increasing rate. Working for the Canadian Government-funded Geolab, it is Larry Newitt's job is to track the wandering north magnetic pole. Every few years he undertakes a seven hour flight from his base in Ottawa to Resolute Bay, the closet inhabited spot to the magnetic pole. Then it is a three-and-a-half-hour flight north in a Twin-Otter aircraft which will land on ice. Today the pole is at sea and the expedition can only be done at the end of the winter when the sea is frozen. Placing magnetic sensors on the ice the expedition attempts to surround the magnetic pole and triangulate its correct position. But each time they go back it's moved. "We're following it across the ice," Larry Newitt told BBC News Online. "It jumps around from day to day and year to year and we have to keep track of it." Measurements of magnetic poles position in 1904 by explorer Roald Amundsen put it in roughly the same place as an earlier though less accurate measurement made in 1831 by the British explorer John Ross. Since then it wandered slowly northward until about 30 years ago when it started behaving differently. "There was a slow drift northward but it then started to move faster. It is now moving northward, away from Canada to Siberia, at a rate some four times faster than it used to," said Dr Newitt. Soon, he added, expeditions to the magnetic pole would become more difficult as it moved out of range of the Twin Otter aircraft. The reason for the wandering of the magnetic pole is twofold. One cause is from beneath our feet, the other from above our heads. Short-term jitter is caused by the influence of the solar wind on the Earth's magnetic field high in the atmosphere. But the steady drift reflects what is going on in the Earth's core. But something else is happening to the Earth's magnetic field: it is getting weaker. David Kerridge, of the British Geological Survey, told BBC News Online: "There is strong evidence that the field is decreasing by about 5% per century." Some researchers suggest that it could be the start of a geomagnetic reversal, when the strength of the Earth's magnetic field decreases and then returns a few thousand years later with the north and south magnetic poles reversed. Looking back in the geological record it is clear that on average such events occur about every 250,000 years. However, it has been 750,000 years since the last reversal - so we are certainly overdue. Magnetic measurements made on the surface suggest that a region of the Earth's core under South Africa is of a different polarity to the rest of the magnetic field in the core. It may grow and initiate a flip, or it may die down. Whatever happens will not happen quickly. It will take thousands of years and there is no evidence that when it has happened in the past it has seriously affected life on Earth. As for The Core, David Kerridge said it was absolute nonsense; whilst Larry Newitt told BBC News Online that he believed it "is composed of a few scientifically plausible ideas mixed with a large dosage of sheer nonsense. It should be fun." Newitt, And Others, 2002, "Recent acceleration of the North Magnetic Pole linked to magnetic jerk,” Eos, Trans. AGU, 83, 381. Barton, C., 2002, “Survey tracks current position of South Magnetic Pole," Eos, Trans. AGU, 83, 291. Campbell, W. H., 2003, "Comment on 'Survey Tracks Current Position of South Magnetic Pole' and 'Recent Acceleration of the North Magnetic Pole Linked to Magnetic Jerks,'" Eos, Trans. AGU, 84, 41.